Forging an original sound while not directly copying one’s influences is never an easy feat, but it’s a skill upstate South Carolina’s Broken Testimony have mastered to a T.
Their recipe for supreme sonic success is as follows: Place equal parts Breaking Benjamin, Tool, Alice in Chains, and Chevelle into a rock-driven transmogrifier, press blend, and subsequently create new music that is notably hard-hitting, melodic, and catchy all at once. on June 22, 2018 via Thermal Entertainment. 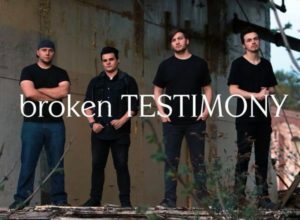 of “Unknown” to the moody slither of “Fade Away” to the ugly metallic screamo head of “Medusa” to the ultimate uplift and release of the album-capping “Vitality,” Broken Testimony have staked their claim for being at the forefront of a new generation that’s leading rock & roll’s ever-evolving melting pot. that’s cool, because we want people to feel we can go as soft as we want or as hard as we want, and still have them like whichever road we go down. And having those moody interludes between some of the songs gives listeners a break to all the chaos going on around them.